Dialight defines the current state of LED lighting technology with continuous innovations in light output, efficacy and reliability for their complete line of high-specification lighting fixtures specifically designed for industrial, commercial, hazardous location, transportation & public infrastructure applications. These results are directly related to Dialight’s ongoing commitment to advancing solid-state lighting products that vastly reduce maintenance, improve safety, ease disposal, and are more environmentally friendly— thereby helping to reduce CO2 emissions into the atmosphere. Dialight has LED solutions for both the interior and exterior of the rail car. 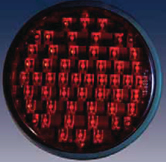 The P46 series is a direct replacement for the 5 ½ “ PAR46 style red rear maker lamp. The 556 series indicators are provided with housings designed for exterior door indicators or by themselves they can be used as interior indicators for a variety of applications. Dialight introduces the DuroSite® Series E26 LED Lamp as a robust replacement for halogen, incandescent and compact fluorescent (CFL) light bulbs in rugged transit applications. The simplicity of installation has made the Dialight LED modules for 5 1/4” transit and 8 3/8” class one railroad wayside signals the industry preferred choice. 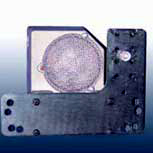 The use of high-flux LEDs in their unique design enables the retrofit of the incandescent lamps without the replacement of the existing housing or lenses. The offering includes replacement lamps for track position signals and bar and triangle signals for light rail applications.